Apply Beauty Balm onto your forehead, cheeks, nose and chin. Massage into your skin using upwards strokes with fingertips or foundation sponge. For extra coverage, apply another layer. For fuller coverage or a more matte finish, apply your normal powder on top of balm. 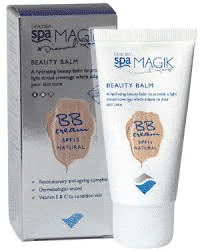 For extra hydration use Spa Magik 24hr Marine Miracle Moisturiser before applying Beauty Balm Cream.